Dawson joined Dale from Radcliffe Borough in February 2009. 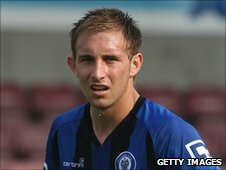 West Brom have signed Rochdale defender Craig Dawson for an undisclosed fee and have immediately loaned him back. The 20-year-old has signed a three-year deal, plus a year's option in the club's favour, but has rejoined Dale on loan until the end of the season. Sporting Director Dan Ashworth told the club's website: "We're delighted to welcome Craig to the club. "He is an exciting young prospect who we have thoroughly scouted and he is an imposing lad with bags of potential." Dawson has also been tracked by Middlesbrough and was widely regarded as one of best young prospects outside the Premier League. Ashworth added: "We wish him all the best at Rochdale for the remainder of the season and we'll be closely monitoring his progress."